Oscar Santillan brings a new level of commitment to the rampant physicality of contemporary art. 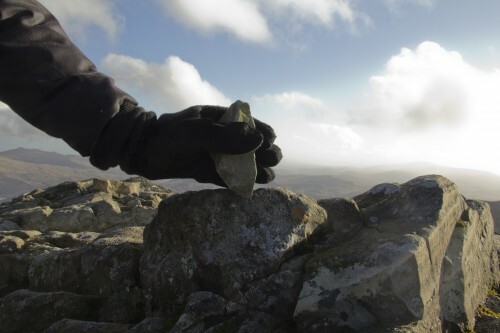 The self-taught Ecuadorian artist, for his first UK solo exhibit, will scale England’s highest point at Scafell Pike – a total vertical accomplishment of 922.93 metres. At the peak, Santillan will collect whatever material forms England’s highest centimetre, making the country one centimetre shorter. This distinctive work, titled The Intruder, requires, essentially, the grand theft of a nation’s geographic apex. In a sense, Santillan is aptly titling his piece with the expatriate’s or foreigner’s ongoing (and antediluvian) dilemma – the discernable intrusion of any “othered” person into a concretely unwelcoming social sphere. The Latin American artist’s heist-like maneuvering of one boundary upon which he is able to extend his influence, in a direct and physical manner, is perhaps a testament to the antiquated discussions around modern-day borders – from whom are they ‘protecting’ us, and for what goal are the discourses surrounding their unrealistic and spatially, ethnically, and otherwise biased impermeabilities so unsympathetic?